Sam Hickling recording pest establishment in our tropical glasshouse. 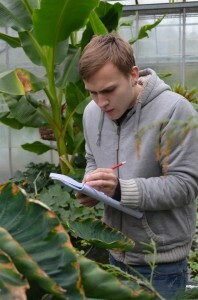 Sam Hickling, is conducting a survey for his honours project in the BSc in Zoology in the School of Biological Sciences at the University of Readingto help design and specify an Integrated Pest Management (IPM) programme for the Tropical Glasshouse display at the University of Reading. To aid in this Sam aims to gather factual information on how pest management is practised by other organisations that have tropical plant displays under glass. Results from the survey will be published on the Tropical Biodiversity blog http://blogs.reading.ac.uk/tropical-biodiversity/ipm/. If you would like to help out then please read the Information for Participants IPM survey 2013 then go to http://www.survey.bris.ac.uk/reading/ipmtropical.